Arizona Cardinals offensive coordinator Byron Leftwich on the sidelines during the first quarter against the Seattle Seahawks on Dec. 30, 2018, at CenturyLink Field in Seattle. Leftwich was one of 18 assistant coaches hired. He played for the Bucs in 2009. 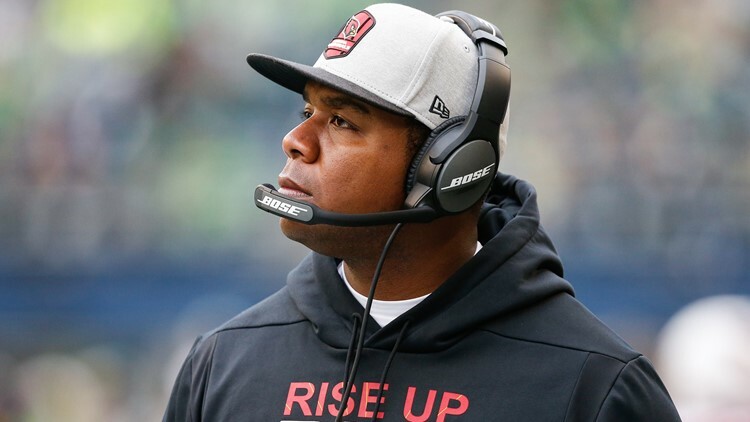 TAMPA, Fla. — The Tampa Bay Buccaneers have hired Byron Leftwich as their new offensive coordinator. Leftwich was among 18 assistant coaches hired, the team announced Wednesday. The former NFL quarterback played for the Buccaneers during the 2009 season. The 10-year NFL veteran became a coach in 2017 for the Arizona Cardinals. Leftwich, 39, was promoted to offensive coordinator in 2018 after Mike McCoy was fired midway through the season. During the 2018 season, the Cardinals ranked last in the NFL in points per game (14.1 points per game) and total offense (241.6 yards per game). Cardinals head coach Steve Wilks was fired after one season with the team. Leftwich and new Buccaneers head coach Bruce Arians worked together in 2017 in Arizona. While Arians has called offensive plays during much of his career as an NFL coach, he will give the responsibility to Leftwich in 2019. "I've been training guys for this job, and I always said I would never give it up and look over anybody's shoulder until I found one I knew could do it," Arians said. "Byron, I think, is a rising star in this business. What he did with the interim title out there, it wasn't even his offense. It was Mike McCoy's offense and he did a heck of a job with some rookies." Tampa Bay had already announced hiring defensive coordinator Todd Bowles, special teams coordinator Keith Armstrong and assistant head coach/run game coordinator Harold Goodwin. Eleven of the 18 have previously worked on an NFL staff with Arians.